I received no compensation for this post. I received one meal free from Green Chef. This post contains a referral link. Please do your own research before purchasing products or using services. Your opinions and results may differ. I'll give props to my husband; he's an amazing cook. He will make up a concoction and it will come out tasting like a gourmet meal. I'm not quite as gifted. I'm also the one that usually comes up with the meal plans, while he's the one that executes them. I get creative from time to time, but don't really venture with new or foreign ingredients. I recently discovered a company that gives me all I need to create marvelous cuisine. All the ingredients and recipes are provided for the meal plans and all I have to do is follow the instructions. Green Chef has made it easy for me to fix meals that are tasty and out of the ordinary. I chose to try a carnivorous meal from Green Chef, and I received the ingredients to prepare Chicken Pibil. It is a Mexican-inspired dish with chicken breasts marinated in a spiced citrus sauce. 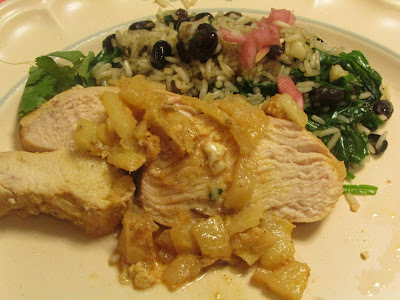 As a side, there was cumin-seasoned rice and roasted jicama with lightly wilted spinach. All ingredients were with the box I received, with the exception of salt, pepper, and cooking oil. My teen son, Adam, helped me create the dish. It turned out quite delicious. You create an account and pick your dietary and delivery preferences. Green Chef then supplies fresh, sustainable, organic ingredients that are pre-measured and largely prepped. Using the recipe card, you cook delicious dinners in around 30 minutes. The good thing about Green Chef is that there's no minimum commitment. You can skip a delivery or cancel your subscription at any time before the weekly cutoff. I was quite satisfied with the company and its delivery of fresh ingredients and recipes. Discount: Cook organic with Green Chef. Sign up with my link and receive four free meals! Sounds tasty! I like how there is no commitment required! This does sound like a convenient way to prepare meals at home. I'm not creative in the kitchen and this would be so helpful.